I met up with Hannah and Faraz at Chopwell Woods in Gateshead for our forest hike engagement shoot. With Faraz working away, we had a devil of a time arranging our couples session, so we ended up squeezing it in in the middle of the day. This isn't the optimal time of day for the best photography results as the sun is directly overhead and can be harsh, leading to 'panda eyes' where the sun hits people's eyebrows leaving their eye sockets in complete darkness. It also means that people tend to squint with the glare. However, it is the job of a professional photographer to take good photographs no matter what the conditions. Indeed, it's situations such as this that marks the difference between an experienced professional and an untested amateur. My approach to this shoot was not to fight the light, by using flash photography to overpower the sun for example, but to work with it. I knew I'd be converting a lot of the photographs to black and white, as that suits the high contrast conditions. I shot with cover overhead, whether that was under a rail bridge or in the shade directly under a tree. And for a few shots I included the harsh sunlight and let the highlights blow out for that sun drenched light and airy feel. My one concession was to use a smoke bomb to modify the light. It was a still day, so once the billowing clouds had dispersed the smoke hung in the air and took the glare out of the unblinking sun. I had an awesome time exploring the woods with Hannah and Faraz. They proved to be very easy to direct and were totally unfazed by public displays of affection, so the shoot became very intimate very quickly. They were patient as I experimented with the smoke bombs and the Brenizer technique (on the sun drenched shots on the bridge) and I was very happy with the results, despite the tricky conditions. 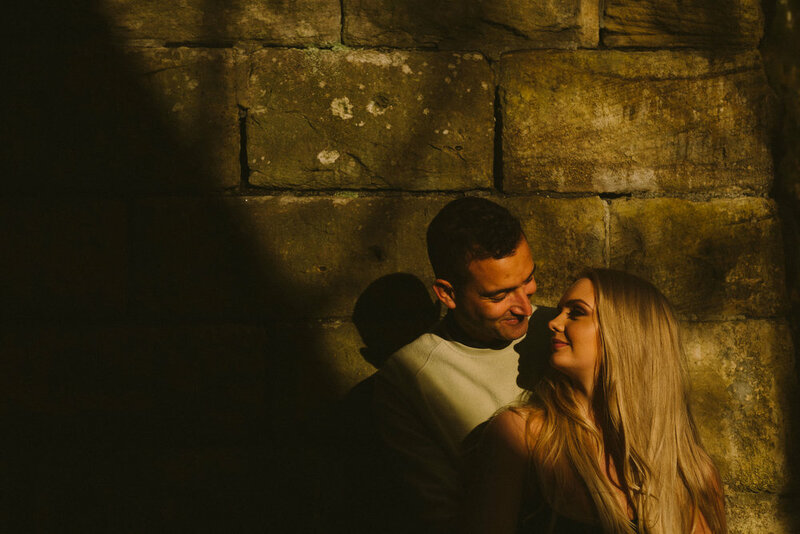 To see more Newcastle engagement sessions and real weddings check out my Newcastle weddings page.